Ricoh is offering a $30 rebate on the Ricoh Theta SC. Regularly $299.95, it’s now available for $269.95. Ricoh Theta SC is Ricoh’s mid-range Theta camera. It has most of the features of the flagship Ricoh Theta S, including the Theta S’ sensor, but it can record only up to 5 minutes, and doesn’t have livestreaming. The Theta SC is available from Amazon and B&H Photo. 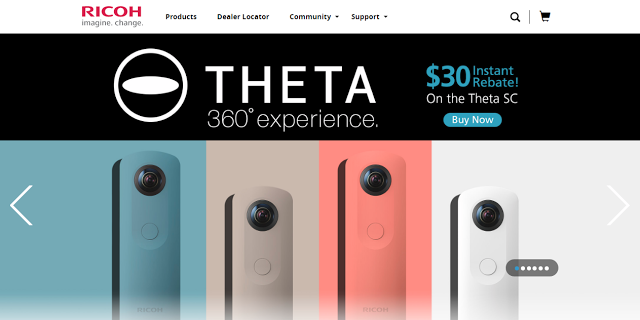 The Ricoh Theta S is also available at a discount at some retailers for as low as $305 (regularly $349.95). Thank you very much to M.S. for bringing this to my attention! Exclusive preview: Insta360 will enable one-button 360 livestreaming!